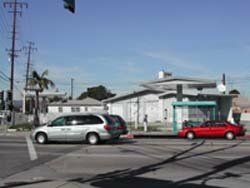 Today, they bulldozed the Shell gas station and Michael's Flowers, two long-time vacant buildings on the northeast corner of Washington Blvd and Centinela Ave. This is just down the street from where I live and directly behind the bus stop I use every morning to catch the Santa Monica Big Blue Bus, Line 14, to work. Culver City plans to build a new mixed-use structure on that corner where there will be commercial units on the ground level and residential units on top. The project is described here. I was happy to see work begin this morning. I have been looking forward to having something new on that corner since I moved to this neighborhood over 5 years ago. The empty buildings have been somewhat of an eye sore, collecting graffiti and trash. I'm not sure what will go in there when it's done, but I'm hoping for any of the following: a cafe, bar, restaurant, cleaners, haircut store, gym, market, or movie theater.